GMs Hikaru Nakamura and Gata Kamsky entered round nine of the 2012 U.S. Championship tied with six points apiece. They could not have had more different days. 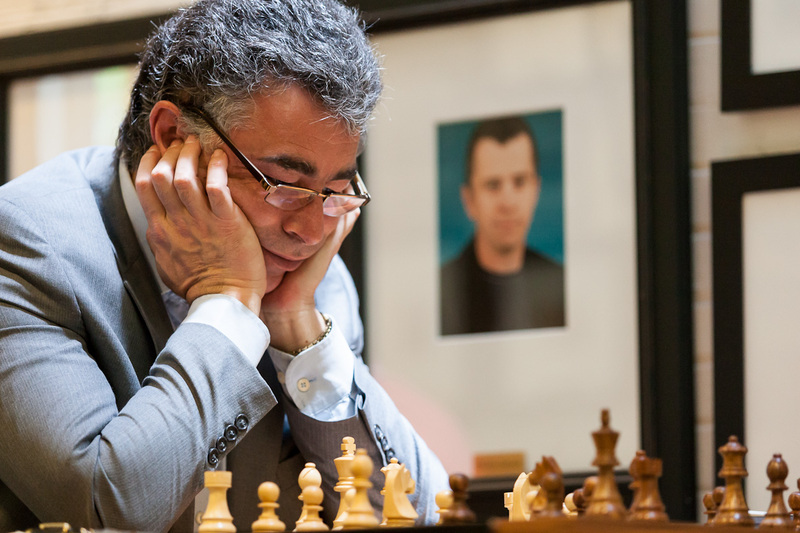 Kamsky won largely without any over-the-board effort, defeating GM Yasser Seirawan in a little more than two hours by using a spectacular combination. He had most of the moves worked out well in advance. Nakamura labored for nearly six hours and 121 moves but could not break through against the stubborn defense of GM Alex Lenderman. He reluctantly agreed to a draw. His matchup with Kamsky tomorrow will mean he is playing from behind for the first time in the tournament. Kamsky now has seven points, while Nakamura is at 6.5. Kamsky played the first 25 moves effectively in negative time, as the 30-second increment for every move offered him five more minutes than he began. His sacrifice 22. Bxh6 was played automatically, and a stunned Seirawan ran low on time contemplating the combination. The superior preparation netted the defending champion Kamsky a pain-free win. “I knew yesterday he would play the Caro-Kann,” Kamsky said. He reviewed the opening again this morning, and Seirawan walked right into some preparation that Kamsky had saved from several years ago. “There are so many lines to prepare for, the chance that you will go into this one is terribly small,” Kamsky said. Seirawan guessed that he may have actually seen the trap before, but failed to remember the intricacies. Unbeknownst to him, all moves up until 24...Nxd7 had occurred over Kamsky's practice board before. If Seirawan had not sacrifice his queen, then after 23...Nxd7 24. Qd2 Kh7 25. Ng4 is incontrovertible proof of the soundness of the attack. Meanwhile, Kamsky's rival Nakamura had his hands full trying to inject life into his game with the much lower-rated Lenderman. The night before, Lenderman lost his first game of the tournament to Kamsky, and remarked that he needed more practice playing against 2700s. He got copious amounts of board time with another 2700 today. After Nakamura reverted back to his usual 1. d4, a Nimzo-Indian led to both kings castling on the queenside. The board soon locked up, and Nakamura spent 40 moves shuffling his pieces around the back ranks searching for the right time to break through. His king traveled east as far as it could, and finally a c-file breakthrough was attempted. Just when it seemed the newfound pressure would be too much to bear, Lenderman deftly sacrificed a few pawns to engineer an endgame blockade. Two pawns to the good, Nakamura admitted he was out of ideas and whispered, “Draw?” to his opponent. After playing the sixth-longest game in U.S. Championship history, mostly idling or on defense, Lenderman agreed without hesitation. Fellow competitors GM Robert Hess and GM Alejandro Ramirez came up to ask Lenderman why he did not play on, as they deemed his position better. “I didn't expect I could possibly have winning chances,” Lenderman said. Kamsky will take white versus Nakamura tomorrow. If Kamsky is able to win, he will clinch his third consecutive national championship. GM Alex Onischuk, the third seed, maintained exactly that place by sacrificing the exchange against GM Gregory Kaidanov. His multiple passed pawns were too much to handle in the endgame. Onischuk, whose performance rating is more than 2700, is the only other player who is mathematically alive for the title, though his chances are extremely slim. In the 2012 U.S. Women's Championship, both leaders won to keep pace with each other, though IMs Irina Krush and Anna Zatonskih were both worse in their respective games today. Zatonskih also had a worse position according to pundits. Her opponent, IM Rusudan Goletiani, had a healthy space advantage and the only bishop on the board. Zatonskih cleared out the long diagonal, then began focusing on Goletiani's errant knight on h4. Goletiani had to retreat to rescue her steed, and Zatonskih's pieces overwhelmed the position. Goletiani tried the same desperate strategy as yesterday, pushing all of her pawns at her opponent's king, but without queens on the board, there was not enough counterplay. Goletiani dropped into a three-way tie for third with WGM Sabina Foisor and WGM Tatev Abrahamyan. Foisor drew miraculously today when her opponent, WIM Viktorija Ni, played beautifully but inexplicably botched a king-and-pawn ending. Instead of 67. f3, which resulted in a draw, the direct 67. Kxh6 wins, as Foisor would then have to chase down Ni's pawns even farther. The title will go to either Krush or Zatonskih. If one woman manages to win in round nine and the other does not, a clear winner will emerge. If not, a playoff Sunday will ensue. The women get an off day tomorrow while the U.S. Championship resumes Friday for round 10. Tune in to www.uschesschamps.com at 1 p.m. Central, 2 p.m. Eastern for live commentary from GM Ben Finegold and WGM Jennifer Shahade.